Querencia, in Spanish, means the place where one feels secure — a home, a place one can nest or center or rejuvenate. With its 40 ridge-top acres, walk paths, gardens, grapevines and jaw-dropping views, Querencia offers four luxury rooms featuring fireplaces, private patios/balconies, and showers EIGHT FEET in diameter, the bed-and-breakfast proves to be just that: a place to nest, center and rejuvenate. 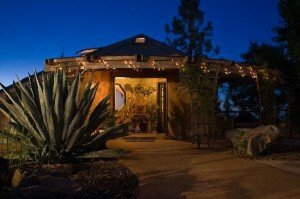 Having been featured on HGTV and EYE ON THE BAY and in such publications as “Sunset” and “San Francisco Magazine”, Querencia is a pretty special inn. Mike and Mary Jo have taken great care in creating an atmosphere of serenity and are constantly updating and upgrading to ensure each guest has a truly lovely experience. From three-course breakfasts to wine and appetizer pairing, they hit every detail right on the mark. Just four miles from the center of Murphys, you can easily spend a day hiking or biking, wine tasting or shopping, boating or golfing and still be just minutes from your Querencia sanctuary. It certainly makes for a romantic getaway or, at the very least, a little something different. At Querencia, you can spoil yourself a little. And why not?